The Tri-Nations is looming on the horizon and the southern hemisphere superpowers have a pretty good idea where the balance of power lies in world rugby after a successful end to their inbound tours. The result of the weekend surprisingly belonged to the Tri-Nations' upstarts, Argentina, who blew away the challenge of a dismal France 41-13 in Buenos Aires on Saturday afternoon, rounding off a spotless showing for the south. Their bickering siblings, New Zealand, Australia and South Africa had already brought the curtain down on their June campaigns with victories, whether as a result of a rediscovered edge or gritty refusal to let anything slip further as the crunch beckons. New Zealand kicked off the day with their latest victory over Wales, a 29-10 triumph at Waikato Stadium in Hamilton. Richie McCaw bagged his 40th victory since taking the reins, overhauling Sean Fitzpatrick as the All Blacks' most successful skipper while keeping alive their 57-year dominance of the fixture. A classic it was not, with a greasy surface contributing to 15 handling errors from the home side and an officious performance from referee Jonathan Kaplan often reducing the game to a succession of whistles. With the Springboks arriving in New Zealand for their Auckland Test on July 10, Graham Henry and his coaching staff will welcome the reality check after canters against Wales last weekend and against Ireland. Wing Cory Jane and replacement Aaron Cruden scored tries for the home side but it was Wales' willingness to concede penalties that proved their undoing despite an improved display. Dan Carter slotted 17 points under little pressure as the hosts proved that even in an under-par performance they still have too much for Wales to handle. "These guys could have thought about getting on the plane tomorrow and going on holiday for six weeks but they didn't do that and that's what I was really proud of," said Wales boss Warren Gatland. "They showed some character out there and wore that jersey with some real pride. That's a massive step in leadership from a lot of players. There's still a gap, let's be realistic. But we've got a massive amount of learning out of the last two weeks." 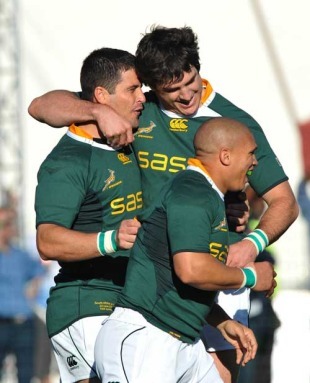 Hours later the Springboks rediscovered their swagger in East London, blitzing Nick Mallett's Italy 55-11. A disappointing display in Witbank last weekend had drawn hoots of derision from coaches and media alike and with their full complement, and skipper John Smit, back in the saddle the reigning Tri-Nations champions fired a warning shot to the All Blacks that nothing but their best will do at Eden Park. While Italy did not provide a thorough examination of their credentials the ease at which the Boks shifted through the gears was a telling reminder that the kick-chase kings of last season have matured. Their rolling maul is approaching its most potent and given both the All Blacks' and Wallabies' neglect of this aspect of the game it could be a game-changer. With their pack dominant there were encouraging signs in the running game of fly-half, and double try-scorer, Morne Steyn and some snappy delivery from Ricky Januarie, while sooner rather than later Bryan Habana will be celebrating a five-pointer as South Africa's leading try-scorer in Tests after drawing level with Joost van der Westhuizen. Carter versus Steyn is set to be a fascinating encounter while the All Blacks' struggles against Wales at the scrum will have been noted. The Franks boys may well be called back by Henry but against Italy Gurthro Steenkamp and Jannie du Plessis looked in good shape. Steenkamp in particular has found a rich vein of form and his loose play was impressive. Bringing up the rear are the Wallabies, whose 22-15 win over Ireland ended a miserable tour and disappointing season for the tourists. Ravaged by injuries they looked tired, and in some areas a little jaded, while the hosts again showed themselves to still be wet behind the ears. The brilliance of Australian pivot Quade Cooper was once again there for all to see and should he negotiate his court appearance on Friday there will be a weight of expectation on his shoulders. His try was a moment of mastery while scrum-half Luke Burgess showed a clean pair of heels to the Irish defence to round off a good few weeks. It may not have been a vintage performance but, following last weekend's loss to England, a positive result was an absolute must for the Wallabies. With Benn Robinson, Stephen Moore, Will Genia, Nathan Sharpe and possibly Digby Ioane all set to return during the Tri-Nations they can count on some much-needed reinforcements. Their scrum, while a massive improvement on their embarrassing display against England two weeks ago, will still have a great big target daubed on it in the eyes of the All Blacks and Springboks. Ireland, like many of their northern hemisphere counterparts, return home winless. A year on from their Grand Slam they appear to be stuck in the mire and few will look back on Saturday's battling effort with any real affection. Rest and recuperation is now the focus for the north, with a doffed cap to Scotland, whose series win in Argentina remains the achievement of the summer - so far.